At the beginning of Vladimir Putin’s first term as Russia’s President in the early 2000s he demonstrated some interest in the great historical Russian figure Pyotr Stolypin and holding him up as a model for his own presidency. Stolypin served as Tsarist Russia’s Minister of the Interior and Prime Minister (1906-1912) and proposed fundamental, wide-ranging liberal and pro-democratic reforms of Russia’s state, political system, economy, and society. He was assassinated in September 1911 by an anarchist in Kiev, having only just begun to implement most of the planned reforms. By contrast, Putin, has eschewed liberalization for the most, and the only Stolypin-like legacy he can rightly claim at this point is a tough policy against terrorism (jihadism). Stolypin’s legacy was greatly distorted by seventy years of Soviet communist propaganda, which focused exclusively on the ‘Stolypin necktie’ and his record of cracking down harshly on the terrorism carried out by anarchist and socialist revolutionary groups who killed thousands of Tsarist officials in the decades leading up to the catastrophe of 1917. In Putin’s first ‘state of the union’ address as Russian president 8 June 2000 to a joint session of the State Duma and Federation Council, Putin referenced only one person, Stolypin. Putin noted: “(W)e do not always manage to combine patriotic responsibility for the future of the country with what Stolypin once described as civil freedoms.” He then added that this explains “why it still is so difficult to find a way out of false conflicts between the values of individual freedom and the interests of the state.” Putin went on to propose economic liberalization, reining in the power of the regions, and questioning whether independent Russian media were really free given the oligarchs’ ownership and usage of them for propaganda and inter-clan conflicts. Three months Putin visited the great Russian writer and Soviet dissident Alexander Solzhenitsyn, after the president had phoned and suggested the meeting, and raised the issue of propagating Stolypin’s. They sit to begin a discussion that, according to his words, Putin wished to have after comments of Solzhenitsyn apparently made during the phone call and with which the president to discuss face-to-face and “perhaps even argue a little.” They switch gears to focus on photographs of the White Army general Kolchak and of Stolypin hanging on the wall in Solzhenitsyn’s working library. Solzhenitsyn describes Stolypin as “the greatest figure in Russia in the twentieth century,” and Putin immediately raises the issue of founding a center or some mechanism for spreading Stolypin’s ideas and pueveying his legacy, which he considers “a good, not a bad idea,” lamenting there is not even something like this in Putin’s native St. Petersburg (where Stolypin spent his career as a Russian official). Solzhenitsyn notes that he has a chapter on Stolypin in his mammoth historical masterpiece novel Krasnoe Koleso and the video edits away to dinner, so we do not know if they agreed on any joint effort in this regard. For a video from the first Putin-Solzhenitsyn meeting and the brief exchange about Stolypin and a center dedicated to him, see the first part of Sergei Miroshnichenko’s biographical documentary trilogy on Solzhenitsyn’s life and career: Sergei Miroshnichenko, “Trilogy 1: Live Not By Lies,” YouTube, http://www.youtube.com/watch?v=0h4RH02NHzE, last accessed on 10 September 2015, at the 37-minute mark. In 2001 the Foundation for the Study of the Legacy of P.A. Stolypin was opened in Moscow with the Russian government’s support. On occasion Putin continues to honor Stolypin’s legacy. 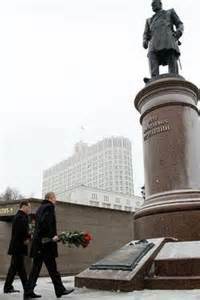 On 27 December 2012 he and Prime Minister Dmitry Medvedev laid wreathes at the new monument to Stolypin in Moscow. But Stolypin no longer figures in Putin’s speeches, and the Russian president never placed the great reformer at the center of a political platform or ideological program. Indeed, Putin’s more limited focus on Stolypin’s legacy in recent years matches the limited similarity between his political record and Stolypin’s actual and potential legacy. Among the other reforms Stolypin initiated or planned before his assassination, included: political liberalization through reforms of the zemstvo councils; the granting of equal rights to ethnic and religious minorities, including the Jews trapped in the Pale of Settlement; protecting workers’ rights, including limits on the working age and working hours; the granting of independence to Finland and Poland by 1923; and the creation of a new government structure, including new ministries for labor, for local self-administration; for nationalities, for social security, for the religious confessions, for natural resopurces for health, and a reorganization of Russia’s traditional ministries; and a radical reform of education to guarantee all Russians a public education (Z.M. Chavchavadze, ed., P.A. Stolypin – Zhizn’ i smert’ za Tsarya (Moscow: Rurik, 1991) and Aleksandr Serebrennikova and Gennadii Sidorovnin, eds., Stolypin: zhizn’ i smert’, (Saratov: Privolzhnoe knizhnoe izdatelstvo, 1991). Only a few of these help us in making a comparison between the two leaders. In the economy especially, Stolypin began to carry out an ambitious overhaul that would create a large middle class on the basis of widespread peasant land ownership. The peasants, left with nothing but freedom from the gentry, were left landless, in poverty, and in debt, becoming an even greater burden on the state as a result of Tsar Alexander II’s hastily-implemented liberalization of the serfs in 1861. Under Stolypin’s reforms, direct land ownership resulted in a reform of the common ownership of land under the obshchina and an end to inefficient land rotation practices, and the new peasant middle class was set up and supported by financial, technological, and other means of support. In addition, peasants were encouraged to move into southwestern Siberia by giving them free land and loans. This led to the migration of hundreds of thousands of peasants to the region and the establishment of an effective agricultural culture in the region and an upsurge in Russian agricultural production and exports. In this area, there are some similarities in Putin’s policies. Since 2000, Russia has become an agricultural power again, exporting large amounts of grain. Internally, a free market domestic agricultural goods production and consumers’ market has been established under state encouragement and financial support for farmers and the creation vertically integrated agricultural companies that carry out the entire cycle from farming to manufacturing, transportation, marketing and sales. In addition, the government has initiated a new program to attract Russians to the sparsely populated Far East by offering free land (http://russia-insider.com/en/politics/russia-giving-away-free-farmland-12-acres-family/ri9653). However, only small portion of which is likely to be devoted to farming given the poor climate and quality of most of the land. Like Stolypin, Putin has carried out a tough policy against terrorism. This is largely where the similarity between the two ends. Stolypin’s era saw considerable liberalization of Russia’s overall political system, despite the monarchy’s increased control over the new State Duma. Stolypin’s began a reform of the zemstvo or land councils that would allow more peasants to vote and participate in zemstvo work. The zemstvo councils were to be extended into the territories of occupied Poland and the Pale of Settlement. Stolypin also planned the granting of full and equal rights to all ethnic minorities, including the granting of the right of freedom of movement and other rights to the oppressed Jews. This Stolypin thought would help spread the Jewish entrepreneurial spirit across the realm and help boost the economy. Civil society was allowed to self-organize more openly, as long as it refrained from terrorism. Freedom of speech and the press were expanded, and the universities were given broad autonomy, becoming unfortunately not just havens of free speech and association but for radical parties’ and terrorists’ conspiratorial activity. By contrast, Putin has eschewed political liberalization, except for the interregnum between his second and third terms during the presidency of Dmitry Medvedev (see Gordon M. Hahn, “Perestroika 2.0: Towards Non-Revolutionary Regime Transformation in Russia?,” Post-Soviet Affairs, Vol. 28, No. 4, October-December 2012, pp. 472-515, www.tandfonline.com/doi/abs/10.2747/1060-586X.28.4.472#.VNIAL53F-uw). However, upon his return to the Kremlin Putin repealed or countered many of Medvedev’s reforms and intensified pressure on the democratic opposition and civil society (see Gordon M. Hahn, “The Russian Federation in 2012: From ‘Thaw’ and ‘Reset’ to ‘Freeze’,” Asian Survey, Vol. 53, No. 1, Winter 2013, pp. 214-223). Putin’s legacy thus far is one of a soft authoritarian regime with little economic reform or overall modernization to lay claim to and increasingly involvement in international conflicts. It includes a roll back of Russia’s hyper-federative relations by over-centralizing power in Moscow. He also asserted the Russian state’s control over television media. Stolypin was less interested, though rather competent in foreign policy than in domestic reforms. But he repeatedly stressed one key point: Russia’s involvement in wars would make it impossible to implement reforms and could bring down the regime. Putin, on the other hand, has been extremely, some might say excessively active on the foreign policy front. However, his activeness in foreign affairs has been imposed on him to a considerable extent by patterns of international politics not of his choosing but rather that of the West, China, the Muslim world, and the much greater degree of interdependence that exists globally today than in Stolypin’s time. Most importantly, perhaps, Stolypin went against the grain of the Tsarist regime’s majority and its basic political instinct of autocracy and centralization and, in general, the stick. His policies would have saved the Tsarist order from revolution – as Lenin, the revolutionary left, and liberals all acknowledged – and paved the way for a transition to democracy and a limited or symbolic monarchy as in today’s Spain and United Kingdom. Putin, on the other hand, harnessed a long-simmering strain of thought within Russia’s post-Soviet elite that seeks to take revenge on the West for taking advantage of Russia’s weakness in the post-Cold War period by expanding NATO among other measures. Thus, Putin reached out to these elements, including some members of the old Soviet regime’s authoritarian-oriented elite, to counterbalance and then squeeze from power Russia’s politically hapless, albeit, democrats as well as radical nationalists and communists as well. Regarding the latter, there perhaps is some similarity with Stolypin, who also eschewed both the radical nationalists of the Black Hundreds or Union of the Russian People and radical communists like the Bolsheviks and Socialist Revolutionary Party. The Putin elite is divided between those more or less indifferent to democratization and integration into the West and those outright rejecting such a course, favoring the reestablishment of more traditional forms of Russian rule or the development of some ‘third way’ at home and the formation of a broad anti-Western front abroad. I have studied Stolypin, I have admired Stolypin, and Putin is no Stolypin. Both men have their political strengths and weaknesses, but the latter appear most strong in Putin. Whereas Stolypin’s policies if fully implemented would have been a strong counter to the revolutionary trends sweeping Russia and the world in his era, Putin’s policies tend to make a regime transformation in the long-term inevitable – whether revolutionary or transitional, it is impossible to tell. The potentially disastrous consequences of a failure to reform politically and economically combined with growing involvement in international conflicts or worse, an actual war, are plain to see when looking at Russian history. Three years after Stolypin’s assassination and Tsar Nikolai II’s failure to find a suitable reformist replacement, Russia entered another disastrous and – for the reforming Tsarist regime – ultimately fatal war. Like its war with Japan in the Far East a decade earlier, World War I would bring revolution, civil war, and Soviet totalitarianism in its wake. If Stolypin had been given fifteen years as Russia’s top leader rather than a mere five years (1906-11) as the Tsar Nikolai II’s subordinate as Prime Minister, then Russia would have unrecognizable in 1921 and today’s Russia would be very different. Now under Putin, there has been a failure both to restructure Russia’s economy away from heavy reliance on commodity, especially oil exports and to liberalize the political order after resolving the very real problems of hyper-federalism and oligarchic control of the state handed over to Putin by his predecessor. This has left Russia vulnerable to the perfect storm of falling oil prices and Western sanctions in response to Putin’s Ukraine policies. At the same time, Putin appears to be allowing or at least failing to avoid or prevent Russia from being drawn gradually into various military conflicts, for example, in Ukraine and now Syria. ISIS’s successes globally and recent events in Tajikistan remind us of Central Asia’s weak regimes and the dangers of an ISIS threat or a resurgent Al-Qa`ida/Taliban threat in that region. So the key question appears to be whether Russia is moving gradually and almost imperceptibly towards a repeat of last century’s disaster? Intelligent discussion, Gordon. Do you find a touch of irony in the fact that Stolypin met his end in Kiev? Putin took a bad hand of cards and has played them far above the grade. You are astute to see that he has stalled out or has hit a point of uncharacteristic irresolution regarding economic and monetary direction. This is not tenable without consequences as you point out. However, Putin often zigs when folks think he must zag and when he pulls this maneuver, her does it rather well. Maybe, maybe not. But best to be on guard.